This month, Gray’s Reef National Marine Sanctuary is hosting the 13th annual Rivers to Reefs trip in association with Georgia Aquarium, Gordon State College and the UGA Skidaway Institute of Oceanography. Rivers to Reefs is an educational expedition of a lifetime for teachers, focused on Georgia’s Altamaha River watershed. During the 6-day trip, the teachers will canoe the Oconee, Ocmulgee and Altamaha Rivers into the Sapelo estuary and then travel offshore to Gray’s Reef on board the R/V Savannah. They will learn and explore the connections between the watershed and the ocean. The teachers will then take the knowledge and experiences gathered from the trip and pass it on to their students in the classroom. Gray’s Reef National Marine Sanctuary Foundation chair Cathy Sakas, a leader of the Rivers to Reefs program, explains that Rivers to Reefs helps teachers learn just how much we touch our watersheds and that our watersheds influence our great global ocean. 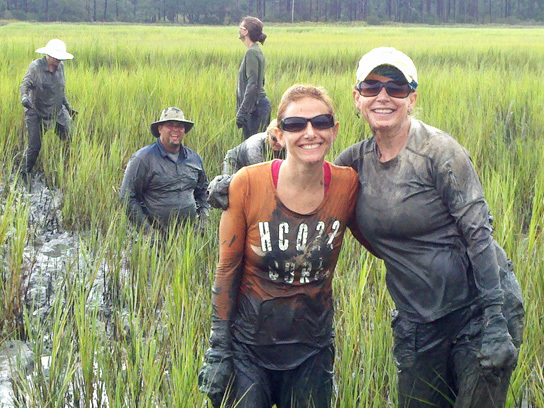 The “marsh crawl” is a memorable part of the Rivers to Reefs program. Editor’s Note: Skidaway Institute professor Marc Frischer is also involved in the Rivers to Reefs project. Marc’s doliolid project is providing the R/V Savannah ship day as part of the broader impacts component of the project. He will be going out with the group on the cruise and conducting a follow-up session the next day. This entry was posted in Gray's Reef, Marine Biology, Marine Science, Oceanography, Science, science education, Skidaway Institute, skidaway scoop and tagged altamaha river, Gray's Reef, noaa, r/v savannah, rivers to reefs, skidaway institute, teachers. Bookmark the permalink.